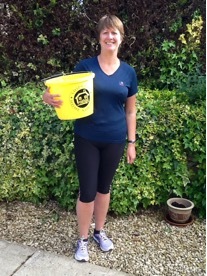 Please Read Gill’s Story and help her raise funds for SHN. I am running the Edinburgh marathon on 31st May in aid of Shipston Home Nursing. My father was diagnosed with lung cancer on 2nd February 1996, his prognosis was seven to nine months but through sheer determination and the incredible care and support from Shipston Home Nursing, he survived a further five years. My mother was diagnosed with breast cancer in January 2003. Again we received the most amazing support from the dedicated staff. Mum passed away on 6th May 2005. I had originally intended to run this marathon simply because I wanted to run another marathon but then realised it was a particularly fitting time to raise some money for such a worthy cause. It is with the same determination that my father passed on to me that I have been putting in the hours of hard training, through plenty of rain and not much shine!! I aim to improve my previous time but more importantly raise some money for this charity so close to my heart.